Reclaiming Conversation (2016) arouses all sorts of deep feelings. Some may feel nostalgia for a time that never was, when we all talked frankly and honestly with each other. Others may feel enthusiasm for the latest, greatest device. Perhaps, defensiveness will be aroused unconsciously to withstand or deter uncomfortable ideas. We bring our personal histories with us as we read about the rapid shift in technology that we have been involved in. That is as it should be. In my case I did not even see a television set until about 1950. I was a freshman in high school, when my father and I watched enthusiastically in a store window, as shadowy, black and white images moved amid electronic “snow.” Before that I had lived in a world of radio, newspapers, books, people, and nature. Today no one graduating from college knows a world that does not include television, computers, handheld communication devices, and robots of varying sophistication. In my lifetime we have moved from assuming face-to-face conversations to assuming electronic doubles and texting. This review, however, is not nostalgic. I enjoyed using all kinds of media to create it and remember back about sixty-six years ago, when I loved climbing up on the roof of our, two-story house with my Dad to put up our first television antenna. It was a moment of great hope, because down below there was not much on our first television set but electronic snow. Reclaiming Conversation is a chance to step back for a moment and consider the enormity and pervasiveness of the change in the technology we now enjoy. Sherry Turkle is an excellent guide to help us think about such questions. She was born in Brooklyn on June 18, 1948, and is now Professor of the Social Studies of Science and Technology at Massachusetts Institute of Technology. Turkle graduated as a valedictorian from Brooklyn’s Abraham Lincoln High School in 1965, a public high school that has graduated three Nobel Prize laureates. She then attended Radcliffe College for a few years, but took time off living and working in France. After finishing at Radcliffe she earned a Masters in Sociology at Harvard University in 1973 and finished her joint doctorate in sociology and personality psychology from Harvard in 1976. Dr. Turkle joined the faculty at MIT about 1981 to study computer culture although there was little interest in home computers at the time except by hobbyists. Her Ph.D. was about how psychoanalytic ideas spread into everyday life in France. She wanted to see if something similar was happening with the language of computers in the U.S. Her thesis was published as Psychoanalytic Politics (1981). Since then her books have been about the digital culture and how changing technology changes the way we think about ourselves and relate to others. 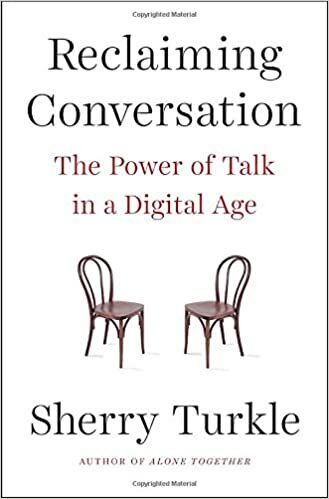 A brief review of Dr. Turkle’s books, leading up to Reclaiming Conversation, shows that she has been a participant in and thoughtful observer of the technological shift in our culture for over thirty years. Her teaching at MIT put her right in the middle of the exciting research that helped create this change. 1890 Herman Hollerith designed a punch card system to calculate the 1890 census. This approach accomplished the task in three years and saved the government $5 million. (The 1880 census took seven years to tabulate.) Hollerith established the company that would ultimately become IBM. 1936 Alan Turing proposed the “Universal Computing Machine” in a paper called “On Computable Numbers.” He separated the machine function from the program to direct that function. This meant that changing the program would no longer require re-wiring and re-structuring the machine. 1946 John Mauchly and J. Presper Eckert, former University of Pennsylvania professors, received funding from the Census Bureau to build the UNIVAC. It was the first commercial computer for business and government applications. 1947 Shockley, Bardeen, and Brattain of Bell Labs invented the transistor, which replaced the vacuum tubes, which previously ran computers, radios, and other electronics. This reduced the size of the machines and the heat the tubes generated. Vacuum tubes ran most computers during the 1940s and 1950s. 1948 Sherry Turkle was born in Brooklyn. 1949 George Orwell published 1984, which was a cautionary tale about Big Brother, doublethink, thoughtcrime, Newspeak, and Room 101. The term “1984” now symbolizes government surveillance and manipulation. “Doublethink” means the power of holding two contradictory beliefs in one’s mind simultaneously, and accepting both of them. An example is the slogan: “Ignorance is strength.” Another example is: “Big Brother is watching you.” “Room 101” is where people’s minds are so totally destroyed that they have been totally reprogrammed. “Room 101” involves one’s greatest fear, such as rats, and is used by the Thought Police to accomplish total reprogramming. We need, Orwell seems to be saying, to confront our deepest fears to remain human rather than being totally reprogrammed. 1953 The first all-electronic color television was introduced, but high prices and scarcity of color programming slowed its acceptance. The first national color broadcast was the 1954 Tournament of Roses Parade, but during the following ten years most network broadcasts involved local programming and were in black-and-white. It was not until the mid-1960s that color television sets began to sell in large numbers. 1958 Jack St. Clair Kilby of Texas Instruments invented the first integrated circuit or chip. The chip replaced transistors, which had become increasingly prone to error. As the connections became more complicated there were failures in the soldering. The chip was more accurate, reduced the size of the computer, and increased its speed. 1960s Large mainframe computers became more common in large industries, the US military, and the space program. IBM was the market leader selling these large, expensive, error-prone, and very hard to use machines. By 1965 about half of the television programming was in color. By 1972 it was all in color. 1973 On April 3d Dr. Martin Cooper, a Motorola researcher and executive, made the first mobile call from a handheld telephone. 1976 Steve Wozniak created the first Apple computer. Two hundred were built. Steve Jobs commercialized Wozniak’s invention. Their success confirmed the growing interest in home computers. 1984 Apple introduced the Macintosh with a television commercial during the Super Bowl. The price was $2,500 and this was the first successful mouse-driven computer. Dr. Turkle published The Second Self. 1985 Steve Jobs ousted from Apple. 1990s Apple’s Macintosh Portable met with little success in the marketplace and was redesigned as the PowerBook with a built-in track ball, internal floppy drive, and palm rests. 1995 It was no longer necessary to log on from a desktop, where the computer was tied to it electrical source. We became “mobile,” so the network was always with us. In the world of robots a step was taken beyond their use to replace humans for difficult or dangerous jobs. They were constructed to simulate emotions and become our “friends.” Turkle published Life on the Screen. 1996 Steve Jobs returns to Apple and emphasized simple design and a recognizable product, which resulted in the iMac. 1998 The iMac was marketed for $1,300. It saved Apple from near-bankruptcy by its ease-of-use and colorful case. 2007 The first iPhone was released. 2010 The first iPad was released. 2011 Steve Jobs dies. Turkle publishes Alone Together. 2016 Turkle publishes Reclaiming Conversation. As you can see, Dr. Turkle published three books from 1984 to 2011, which paved the way for Reclaiming Conversation in 2016. The first book in this series was The Second Self: Computers and the Human Spirit (1984). It discussed technology with, as she said, “hope and optimism,” but she cautioned that it defines how we think and act. She interviewed children, engineers, hackers, and others to explore this relationship. In Life on the Screen: Identity in the Age of the Internet (1995) she studied the evolution of how people used the computer and the effect the machine had on its users. She argued more strongly in this book that there is a fading boundary between us and our devices. We previously considered ourselves different from machines because we have feelings, but now our minds were being understood as if they were computers. In addition robots had been invented that could simulate emotions and pretend listening. Turkle’s third preparatory book was Alone Together: Why We Expect More from Technology and Less from Each Other (2011). It described how loneliness is failed solitude and without solitude we begin to lose our empathy for and interest in other people as unique human beings. The constant effort to be connected, subverts solitude, which ironically results in loneliness and curbs empathy. The key research supporting the idea of the loss of empathy involved some 14,000 college students. The study reported on changes from 2000 – 2010. During this decade students revealed “a dramatic decline in interest in other people.” The authors of the study associated the “students lack of empathy with the availability of online games and social networking. An online connection can be deeply felt, but you only need to deal with the part of the person you see in your game world or social network (293).” People became so absorbed by their screens that they didn’t feel any need to try to understand actual people. It was too much trouble. Friction in relationships was dealt with by texting rather than face-to-face encounters or by phone. Turkle argued that our involvement with screens is not like an addiction. We are vulnerable, not addicted. The answer to an addiction is to take away the addicting substance. We don’t need to take away our devices. What we need to do is find a way to use them well so we are not reduced to their limitations. A summary of Professor Turkle’s views can be seen in a TED Talk, filmed in February of 2012. Her first TED Talk was in 1996. At that time she was celebrating life on the internet and was on the cover of Wired Magazine. Her views shifted over the intervening sixteen years to become a tech skeptic, but a hopeful one. She argues that the antidote to the narrowing of the human being by adapting to our machines is human conversation. The book reviewed here makes that case. Reclaiming Conversation acknowledges that we absent ourselves from those near us, even our children and with others in the presence of children. This teaches the young of our species the same cyber etiquette, which adults use. Our divided attention between those near us and those in touch electronically reduces our ability to be empathetic, as mentioned above. We are, however, resilient. As Samuel Johnson said in The Rambler (1752): “We had talk enough, but no conversation.” The need for conversation today is not a luxury. It is critical for our species to remain human. Henry David Thoreau moved to a cabin on Walden Pond in Concord, Massachusetts, in 1845 to learn how to live more deliberately. He was not a recluse. He wanted to be carefully conscious of his communication. He had three chairs in his cabin. One was for solitude. A second chair introduced the possibility of friendship. The third chair was for society. The three chairs introduce what Turkle calls a “virtuous circle (9-11).” If we can truly occupy the single chair of solitude for self-reflection, then, we can be better friends. If we can be better friends, then, our society will be more humane. We need to understand ourselves to understand others. We need a point of view to see their unique otherness. When the conversation became more expansive than possible for the three chairs, Thoreau took his guests outside into nature, his “best room.” Today, however, what is “nature”? It is a conflicted place, a mixture of the natural and the virtual. Turkle suggests we need a fourth chair to contemplate these differences. As Turkle puts it, “The fourth chair raises the question: Who do we become when we talk to machines (337)?” She further asks, “Has simulation of empathy become empathy enough? She also wonders if the simulation of communion is communion enough (338). To answer these questions let us turn now to the argument she makes using Thoreau’s chairs to guide us. We need solitude, but a pause in exterior stimulation signals for many that it is time to reach for the phone. This is because boredom has become confused with solitude. The reason solitude is so important is that this where empathy originates and empathy is the means for conversing well with others. We can put ourselves in another person’s place because we have a self of our own to see our differences. Developmental psychology has long made the case for solitude. Now neuroscience joins in. It is only when we are not reacting to external stimuli “that we engage the part of the brain’s basic infrastructure devoted to building up a sense of our stable autobiographical past (61).” Without solitude we can’t develop a stable sense of self, so we don’t have a point of view by which to understand others. Turkle uses Paul Tillich to point out that “solitude” expresses “the glory of being alone” while “loneliness” expresses the pain of being alone. The origin of the pain comes from a “want of intimacy” when we needed it most, during early childhood. “Solitude — the capacity to be contentedly and constructively alone — is built from successful human connection at just that time (65).” Many children today say that their parents did not teach them to value time alone (66). The stumbling block to empathy is what Turkle calls “disconnection anxiety.” When exterior stimulation fails we immediately seek to engage it. It is as if our phones are training us to be bored with anything other than our phones (73)! Surfing is not solitude. Solitude is when you gather yourself into a single point of identity. Ironically dispersing yourself to stay connected produces loneliness. There is a difference between self-reflection and getting data about yourself from an app, such as a program designed to mimic the manner of a therapist, or devices that help you track your physiology for patterns, or an app that analyze the words in your diary to diagnose your mental state. There are two problems with confiding in an app. One is that we don’t know what is in the algorithm that sorts this data, so there is no way to evaluate what the “readout” is telling us. Not all data have the same value nor are they equally relevant. Second we don’t know what information the app is providing to those collecting information about us. The traces we leave are indelible, to be processed by the apps of others when they so desire. The data of the quantified self is in need of someone “to story” it rather then merely add more data. A number without a narrative may rate you against an unknown standard, but mutual story telling can’t be reduced to a number. It takes both the telling and hearing of it to make the meaning. Perhaps, the key worry with the readout is that it causes us to act rather than reflect. In the language of psychology this is “acting out.” Discomfort causes a reaction, which blocks our feelings, but our feelings are where the self-knowledge lies that we need. To find it we must pause and reflect, not act without thinking because an app tells us to. “Connected” parents are distracted from giving their full attention to their children. Parenting is now involves devices in such intimate moments as breastfeeding, family meals, during misunderstandings and disagreements, and at other times. This is painful for the children, who don’t understand why this distraction hurts. The result is that children try to adjust and learn from their parents about how to live without empathy and intimacy. Distraction is taught as normal. Leslie’s eyes are often down at mealtime. She is silent and texting. At age fifteen she is not learning what conversation can teach about the worth of her feelings, how to talk them through, or how to understand and respect the feelings of others. She is learning about feelings from social media and the divided attention of her parents, which discount them. The authenticity of feelings is not valued by divided attention or screens, but performance is. Being on line suggests that you need to put on your best face and not risk vulnerability. Instead of learning how to listen, you learn what goes into an effective broadcast. Leslie is not becoming better at ‘reading’ other people. She is learning how to be more adept at getting people to “like” her (109-110). We don’t know if parents who are ignoring their children would have ignored them if they didn’t have phones, but we do know that either way many parents are ignoring their responsibilities as mentors to teach by example what real conversation is. Dr. Turkle reminds us that distracted parents are nothing new. What is new is sharing parents with laptops and mobile phones. This is different from sharing parents with an open book, a newspaper, or even a television set. This is because texting and email take people away to unseen worlds with more intense and concentrated focus than when parents are looking at something in the same room where others are present (115). At least an open book, a newspaper, or a television set can be seen by children so they can understand in a concrete way what they are struggling with to gain their parents notice. The sociologist David Riesman (1909-2002) was a brilliant and broadly educated commentator on American society. In 1950 he wrote The Lonely Crowd: A Study of the Changing American Character. This was before the widespread use of television in the home. He argued that post-World War II American society shaped people to be other-directed. It shaped them to abandon their inner voice and take on society’s values. An inner-directed person has a point of view so that choices are measured against a personal standard, while other-directed people merely do what society dictates. In today’s world of screens society is more effective at telling us what the crowd thinks than in 1950. What others think can even be immediately quantified. This makes us more vulnerable to being other-directed than in 1950. Today there is even a phone phobia that directs us to texts instead of talking by phone or face-to-face. This means that we don’t talk about how we are being shaped by society. An extreme example of how empathy has changed can be found in the hope for an “empathy machine.” It was Google Glass, an optical head-mounted display designed in the shape of a pair of eyeglasses made available to the public in 2014. Your point of view can be recorded through the glasses as you live your life. The idea is that you will sit down with someone and compare your recordings. The fallacy is that people who are so busy recording and curating themselves will be unlikely to ever have the time or inclination to see the world through another’s comprehensive recording. In this case the rehabilitation of empathy was not accomplished by a machine. As soon as texting established itself in flirting, the strategy of not answering a text developed. This was a breach of normal etiquette. If someone cares about who you are, they are supposed to fire right back. In flirting, however, silence has become important. Its ambiguity keeps people connected by worrying what it means. The “business-like crispness to falling in love,” which uses apps to sort candidates, needed something to complicate the chase (180). When an app converts on line friends into romantic possibilities, the person who texts becomes both the product for sale and the marketing manager. What is most new in this situation, however, is the idea of infinite possibilities, which helps the process be friction free. Texting and “nexting” developed in dating because there is always someone waiting, next in line, who is possibly better. Anonymity on dating sites helps moving on to be smooth and guilt free. Unfortunately, this whole strategy reduces people to a commodity. Talking, which might help sort things out, is avoided, becomes it is too infused with commitment. Texting remains low risk. The question is whether or not people can become real friends without risking vulnerability. Turkle proposes that the “Goldilocks fallacy, ” which advocates for not too much emotional distance nor too little, can be achieved better in texts than on a phone or face-to-face. This is because real relationships can’t be completely controlled. The “just right” ideal is not just a mistake. It is a dangerous miscalculation, because it prevents real relationships, which are messy and can’t be controlled, from taking place. “In classrooms, the distracted are a distraction: Studies show that when students are in a class multitasking on laptops, everyone around them learns less (215).” Some say that fractured attention is the “new sensibility,” so to think otherwise is to indulge in unproductive nostalgia. The solution for distraction is not to help the students learn how to focus but to change the learning environment to fit the students. This kind of thinking was optimistic at first. Classrooms were loaded with screens and additional stimulation to keep students stimulated, but the net result has been to increase the inability to focus. This approach has also contributed to the atrophy of the ability for sustained reading. To be more exact our brains are plastic so they “rewire” themselves be distracted as a normal state of affairs. They can’t concentrate (221). An even deeper problem with gazing and grazing is that it frustrates the development of a narrative to give the exterior stimulation students experience coherence. To make a personal synthesis requires students to have internalized the information they are working with so they have a point of view. When learning becomes reduced to downloading there is no inner ruminating to create personal knowledge. Note taking becomes transcribing instead of creating one’s own synthesis. In 2012 Dr. Turkle listened to her students confess that they could not sit through a class without texting. She called this “the year of the MOOC (228).” A “MOOC” is a “Massive Open Online Course.” The MOOCs were created to cope with the changing abilities of students and to save money. In theory the classroom gets “flipped” to end the “passive” learning from a lecture. Actually, whether a lecture is passive or not depends on the students’ engagement with the lecture and the lecturer’s ability to draw in the students. If a lecture is conceived of as merely transferring data, then any mechanical device will do to record it, but the question is whether such a lecture is real teaching or not. The lecture format per se is not the problem. The problem is one of engagement. That is a human problem. The theory of MOOCs was that students would learn everything ahead of time, which would enable them to spend more time with the professors. That may work in some cases, but Dr. Turkle cites studies showing that many MOOCs are peopled with teaching fellows, who basically go over homework with students. This means that the students miss interacting with professors who love their subjects, are masters of their fields, and can communicate their love with enthusiasm in person. Of course, professors’ time, is more expensive than the time of teaching fellows, so this approach does meet the financial goals by reducing the quality of education. If learning is not just memorizing or downloading data and involves relationships (231), then, the question becomes, “Why do we forget something as simple as this?” Her answer is that technology is so attractive that it makes us forget what we know about life (232). The bottom line is that MOOC designers are now spicing up their offerings with “real people (234).” The basic choice, it appears, is adjusting the format to students’ lack of focus or challenging them to get involved (240). Talking about apps and screens to solve problems of human relationships is irrelevant for the human part of the relationships. What was thought to be a solution for human failings may actually distract us from understanding them. Human problems are not jazzy or cool. They have fallen out of style, because are too low-tech to be interesting. They involve such perennial problems as getting students to keep office-hours appointments with professors. They either don’t show up or text an excuse at the last minute. What we come back to is that teachers and students need to converse to find ways that technology can really help the overall teaching/learning experience. What is still important in teaching and learning is to put students together with those who have the most to teach and who are inspirational, but this is old news. It is boring, so reaching for the phone is the way to avoid it. It is unlikely that technology can “fix” human relationships, open up the deep current of informed creativity, and encourage responsibility. The danger of relying on technology to do this is turning students into robots who are trained to download naturally and are easily programmed. This raises the question of what education is for. Is it to help people become more human or to become more robotic? Turkle’s conclusion is that there are two simple lessons to be learned about the new way of working. One is that getting together in person when possible is good for the bottom line. The second conclusion is that productive leadership can do things to make that happen (272). To make this happen there needs to be another change of the culture. The attraction of technology to “fix” human relationships was used to just change the working environment, but this resulted in dead meetings and a lower quality of thinking. Live meetings encourage real commitment to conversation and focus, when they are well lead and planned. This changes the new/old definition of “strong performers” being defined as those who are always on line to those who make real contributions to thinking. This brings us back to the human dimension of human relations, which is where encouraging support and creativity dwell. Realize our phones are an option, not a necessity. They are powerful devices that change what we do and how we do but also who we are. It is time to be in charge of our phones and not vice versa. Slow down, because the most crucial conversations you will ever have are with yourself. Protect our creativity, so we need quiet time. We need to make our agenda clear and stay in control of it. Boredom does not have to be boring. It is an open door. Its beauty depends on what you make of it. Create “sacred spaces” for conversation. No app can do what speaking and listening can do to keep us human. Think of unitasking as the next big thing. It increases performance and decreases stress in every domain of life. Obey the seven-minute rule. Let every conversation unfold for seven minutes, including pauses, before going for your phone. Challenge the view that the natural world is a collection of apps. Actions in the real world are messy and full of surprises, good and bad. Choose the right tool for the job. If a tool gets in the way of eye contact with other human beings think again. A lack of eye contact is associated with depression, isolation, and the development of antisocial traits such as callousness. Learn from moments of friction. There is much to be learned from human complications. Sometimes the friction is caused by a conflict of the self with technology and its culture, so we need to stop and think. We also need to be alert to being herded into a narrowing of our lives unconsciously. To remember what we already know about life by intuition. Solitude, face-to-face communication, and eye contact are all vital parts of being human. Ask why we avoid difficult conversations. This pertains to everything we do, but one “difficult conversation” many avoid is about our agreements with electronic suppliers to track our digital double for their use or to sell. We also need to question the government’s right to track us. Our digital double is the new, unexplored terrain of privacy that is full of questions and needs conversation. “Leaks” raise the question, but they give no answers. The government and our employers don’t open our physical mail, but in the world of screens they don’t need to. Try to avoid all-or-nothing thinking. The digital world is based on binary thinking, but our thinking as human beings about it cannot be. “Public conversations give us a way to reclaim private conversations by modeling them, including how to show tolerance and genuine interest in what other people are saying. Public conversations can teach how conversation unfolds, not in proclamations or bullet points but in turn taking, negotiation, and other rhythms of respect (332).” We need to be aware that much public discourse models the opposite, so we need to push back against its influence. This chair replaces the times when Thoreau took his conversations out into nature. It creates a philosophical space to ask what Thoreau could not have guessed. What do we become when we talk too much to machines? We are not crazy or addicted in our relationship with machines, but we are vulnerable. We are vulnerable to becoming like machines if we allow ourselves to unconsciously adapt to their constraints. Their basic constraint is that they do not share the human condition. We can adapt to them, but they can’t adapt to us. This is why they cannot be full conversation partners for us. The limitations of machines are especially dangerous for children, because they absorb their environment without critical reasoning. If they adapt to machines they become machine-like. One might say that being like a machine is “alive enough.” Is the simulation of being alive good enough for a companion to teach children how to be human? Is it better than nothing? Is it our only set of options? We need to beware of “better than nothing,” because it can easily become considered “best” if we are not alert. There may not be “qualified” people to raise children and care for elders, but the question is not what kind of machine can do the job well enough. The question is how do we find the right people for the job. When we uncritically treat machines as people, we also begin to treat people as machines. This seems to solve our problem about using machines as if they were people by defining people as machines. Dr. Turkle is a champion for conversation. That is what her book is about. She is a champion for conversation, because it can cure our distraction and the confusion of our self with our digital double. She is hopeful, because in just a week of device free camps in the summer children begin to talk to each other and to go for walks in nature that they can fully participate in. Their empathy returns and they make authentic friends. Still, when they go back to their regular environment it is difficult to maintain their objectivity about their machines and their ability to use them in their best interest. It becomes harder to actively emphasize conversation in their daily lives, as it is for everyone. The moment of truth for Dr. Turkle came while she was visiting a nursing home with a robot in the shape of a baby seal to study how elders related to it. She watched as an old woman tried to make sense of the loss of one of her adult children by talking to the robot. Our involvement with devices is magical in two ways. They do wondrous things and extend our abilities. On the other hand, they fool us as great magicians do. Our enthusiasm for devices works “by commanding our attention and not letting us see anything but what the magician wanted us to see (361).” It is now time, Dr. Turkle claims, to reclaim the humanity of solitude, friendship, and society to make a “virtuous circle” to live by as we use our machines (317). This book reads like a conversation. Turkle’s style tells “stories” (formal cases from studies and her own interviews) to build up a persuasive experience for the reader, rather than providing a bare bones logical argument. Still, the argument’s steps are clear. They are organized by clever headings within each chapter with crystallizing phrases. You can discover the outline of each chapter by copying these headings out on a piece of paper and then looking at them in relation to the chapter title. This approach tends to be repetitious, but the rationale appears to be that we need to hear similar stories over and over again in different contexts to get the point, as in a conversation. The notes are in the back of the book and are identified by page numbers. No numbers for the endnotes appear in the text, so you have to go looking for them. This is sometimes frustrating, but one strategy is to read the notes after reading the book. This is like reading a second book in conversation with the primary one and your own thoughts. We might call this a “three chair” approach. Some endnotes are very significant. They include citations for published studies or the major sources for the book itself. For example you will find on pages 369-370 an important discussion about the interviews she conducted from 2010-2015 for this book and how she compared them with those carried out 2008-2010 for Alone Together (2011) to give perspective on Reclaiming Conversation. The whole topic of media shifts is profound. During the twelfth century Europeans began to shift from oral storytelling and communal, auditory memory to reading texts. At first using the new technology of reading was out loud, “chewing the words” as the monks said, but as the decades past, silent reading took over, especially by the fifteenth century after the invention of the printing press by the German Johannes Gutenberg around 1440. By 1500 printing presses were in operation throughout Europe and had already produced twenty million volumes. This sped up the change and shifted the authority of speaking and memory for making meaning to reading and writing. The era of the literate elite had began. It took about three centuries to shift the medium of communication from speaking and hearing to reading and writing. Today we have shifted our primary means of communication in only about three decades. We have moved from a society of texts to a society of texting in the span of Steve Jobs’ adult life. Steve Wozniak built the first Apple computer in 1976. Steve Jobs, who was then twenty-one years of age, produced and marketed it. By the time of Jobs’ death in 2011, the iPad and iPhone had played a major role in connecting us all in this new medium. The way to cope with this very rapid change is, as Turkle says, to talk together. Conversation has great power. Talking face-to-face is necessary to help us remain aware of how we are changing but also to make good decisions about how we will use the new alternatives for child rearing, for education, for business, for politics and for our inward life of the spirit. We need to converse with ourselves, with each other and with God to have the perspective to enhance our understanding of what is happening and to develop our sense of humor about being alone together and what to do about it. One of the great puzzles is theological. I will put this in Christian terms. How does this shift relate to the two core guides to life (Matthew 22;35-40; Mark 12:28-31; Luke 10:25-28; Deuteronomy 6:4-5; Leviticus 19:18)? How will loving God and others fare if we forget solitude, friendship, and social conversation? This is not a call to put down our devices. It is a call to use them well to become more human, rather than less. Posted in Book Reviews on November 8, 2016 by admin.